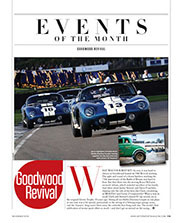 Just when you think the Revival can’t offer anything new, the team at Goodwood throws in another attraction or race that you won’t find anywhere else in the world. While managing to gather some of the most important cars from BRM and Surtees’ histories, Goodwood also invited nine WWII veterans who ﬂew from RAF Westhampnett between 1939-45 for a ‘moment of remembrance’ on Sunday. This moving tribute was helped by the HM Royal Marines Band and a Hawker Hurricane and Supermarine Spitﬁre being ‘driven’ down the pit straight – “only at Goodwood”, as one spectator commented. This year the fairground by the Revival market was moved to the pre-66 car park and replaced by a Tesco supermarket. But this was no ordinary store – it was decorated and stocked with period graphics, food and drink. Although some of the food was modern – offering a welcome break from the usual burger stalls – much of the produce had been specially designed. As always, the sky above the circuit was ﬁlled with Spitﬁres, a Mustang, Hurricane and many other historic planes vying for the Freddie March Spirit of Aviation Trophy. The 1937 Hawker Demon owned by Howell Davis won over judges including actor Rowan Atkinson, chef James Martin, Iron Maiden frontman and pilot Bruce Dickinson, Pink Floyd drummer Nick Mason, former CEO of Rolls Royce Ralph Robins and Fiat chief of design Lorenzo Ramaciotti. 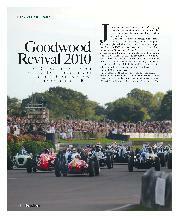 The Revival was again a sell-out, and with the team bringing something new every year, 2011 should be just as popular. 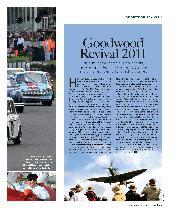 The traditional star-studded St Mary's trophy stole the limelight on the ﬁrst day of racing at Goodwood, as usual. 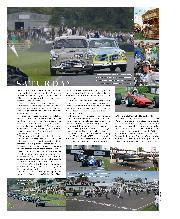 This year it was the turn of the 1950s ‘hot rods’ (sorry, period-spec saloon cars) to entertain the crowd – and how. Eight-time Le Mans winner and Revival debutant Tom Kristensen scored a popular victory in his robust Austin A95 Westminster, despite the best efforts of 1990s touring car racer Patrick Watts and Goodwood favourite Martin Brundle. Kristensen got the drop on Watts as the ﬂag fell, but the colourful Volvo Amazon 122S chased the Danish hero hard in the opening laps. Brundle was soon on the move in his little Austin A35, caught the leading pair and dived up the inside of Watts at Lavant. Now he had his fellow Le Mans legend in his sights, much to the approval of vocal fans in the packed grandstands and banking. At the start of lap nine, Brundle got physical. The A35 front left wing rammed the A95’s rump at Madgwick, but the assault – described later by Kristensen as a “mosquito bite” – backﬁ red on the BBC commentator. A punctured tyre was only the visible tip of the damage and he limped into retirement. Keen to avoid further contact, wise Kristensen waved the determined Watts through next time round and prepared for a last-lap attack. It would not be necessary. 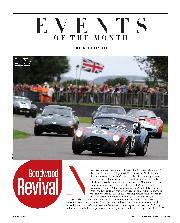 Watts pulled to an oily halt at Lavant a couple of laps later and Kristensen’s win was secure. Kiwi Roger Wills had a strong claim for driver of the day after picking up two silvers and a gold – in three successive races! The victory came by fortune in the two-driver, 45-minute Madgwick Cup for 1950s sports-racers after pacesetters Rob Hall (Lola-Climax Mk1) and Graeme Dodd (Cooper-Monaco) both fell by the wayside. 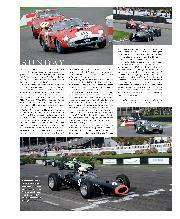 The sting had been taken out of the race, leaving the Lotus 15 of Wills and Joe Twyman an open goal. Wills narrowly lost out in the preceding Whitsun Trophy after a thrilling race-long duel with Scot Andrew Smith in the 1960s big-banger sports-racing prototypes. 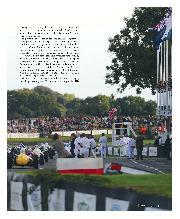 Smith muscled his Lola T70 Spyder past Wills’ McLaren M1B, but the ubiquitous Roger kept him honest to the ﬂag. Wills starred again in the closest race of the day as four Coopers threatened to make the Gordon Trophy Formula 1 race a one-make bash. Back-to-back wins looked on for Roger, only for Nick Wigley’s Rob Walker T51 to slip past his ‘works’ car to steal his thunder. 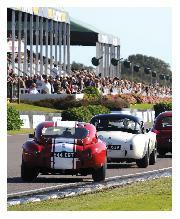 Sunny Saturday kicked off with the beautiful grid of pre-1950 Grand Prix and voiturette cars. A trio of ERAs led from the start, with Mark Gillies in R3A moving ahead of Paddins Dowling (R10B) on lap ﬁve. Dowling retired three laps later, leaving Matt Grist (Alfa Romeo Tipo B) and former DTM ace Frank Stippler (Maserati 6CM) to demote Mac Hulbert to fourth in R4D. Ben Simms (Elva) got the better of Sir John Chisholm (Gemini) in a cracking rear-engined Formula Junior scrap, Darren McWhirter’s Lagonda V12 Le Mans romped to an easy win in the end-of-day Freddie March Memorial Trophy, while BMW British Superbike hero Steve Brogan helped Ian Bain to ﬁrst-blood honours in the two-wheeled Barry Sheene Trophy. Disappointingly, crowd favourite Wayne Gardner failed even to make the start, ruining his hopes of going for the overall win on Sunday. The day got off to an exciting start on track with the Fordwater Trophy for endurance racing sports and GT cars that competed between 1960-66. Nick Swift managed to hold off Rae Davis’ Mini Jem and Shaun Rainford’s Lenham GT to take victory in the previously unraced Mini DART. It was the Richmond Trophy that provided some of the most entertaining viewing of the morning, however, as Patrick Orosco fought to keep his 1959 Scarab-Offenhauser on the asphalt. 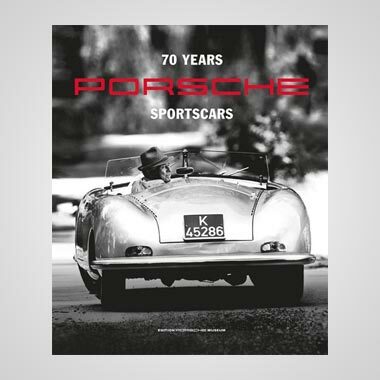 The son of Don Orosco – who was on board another ’59 Scarab-Offenhauser – ran as high as third behind Barrie Williams’ Ferguson P99 and Gary Pearson’s BRM P25. But after two huge moments at the chicane, he ﬁnally spun off at the same place a lap later. Pearson eventually caught the P99 to take victory. The Barry Sheene Memorial Trophy was as good as decided on Saturday after the 1947 Manx Norton of Ian Bain and Steve Brogan ﬁnished over 30 seconds ahead of Duncan Fitchett and Jeremy McWilliams’ 1952 Manx. However, all eyes were on the pairing of 1987 500cc World Champion Wayne Gardner and John Leigh-Pemberton, who had to ditch their 1954 BSA Gold Star after it put a hole in a piston earlier in the weekend. Although they weren’t in contention for the overall win, Lord March found a G50 Matchless for them to run. Gardner proved that he really is the master of Goodwood on two wheels by cutting through the ﬁeld and overtaking race leader McWilliams for Sunday victory. 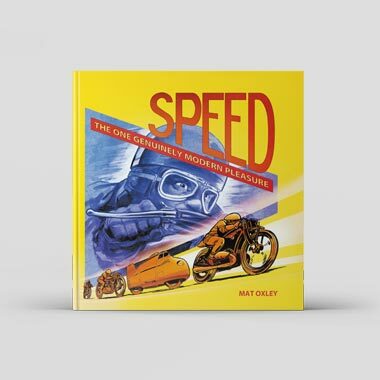 What many people had come to see was the Royal Automobile Club TT Celebration and this year it was more exciting than ever. A safety car period before some of the cars had pitted mixed up the order, but even without it the 1963 Ferrari 250GTO/64 of Jean-Marc Gounon and Peter Hardman would have been hard to beat as it romped into the lead and pulled out a gap of over 20 seconds by the ﬁnish. It was the Lister-Jaguar coupé of Justin Law and Anthony Reid that provided the excitement in the closing stages of the race, as ex-tin top driver Reid moved up the order from fourth, to third and then very nearly second on the last lap. It was only some impressive defensive driving from Nicolas Minassian in the AC Cobra that stopped him. Martin Brundle and Mark Hales also drove a good race and ﬁnished ﬁfth aboard a 1962 Ferrari 250GTO worth a reported $20 million (£12.8m). Sunday’s racing was wrapped up with the 25-minute Glover and Sussex Trophies. The former was dominated by Frank Sytner and his 1962 Lotus-Climax 24 for most of the distance, until Richard Attwood sprang into contention from 16th on the grid. The former Grand Prix driver may have been racing the faster 1965 BRM P261, but he demonstrated just what an underrated driver he is by threading it beautifully into the lead with two minutes of racing left. The weekend-closing Sussex Trophy wasn’t such an exciting race at the front as Jamie McIntyre disappeared in his 1959 Lister-Chevrolet ‘Knobbly’. But further back the crowd got the chance to see Tom Kristensen in action once again after the ’63 Ferrari 330LMB he was going to drive in the TT came to a grinding halt with Bobby Verdon-Roe at the wheel. 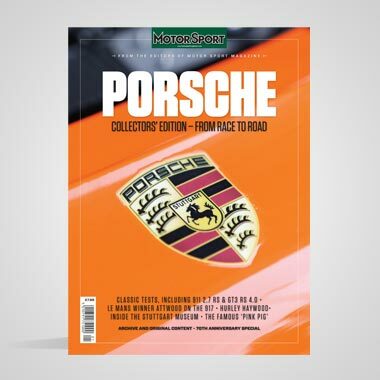 Kristensen, in a Ferrari 246S Dino, tried every move in the book to get past Julian Majzub – and maybe even went one move too far as the Dane forced the Sadler-Chevrolet Mk3 racer onto the grass. By the looks of things Audi’s Le Mans legend was enjoying his ﬁrst taste of the Revival as much as everyone else does.